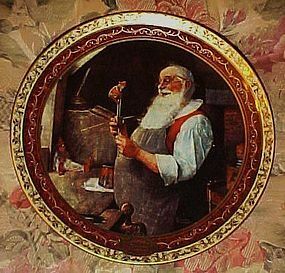 Norman Rockwells Christmas Memories collection Limited edition Plate "Santa in his workshop".Plate is produced on hard-fire porcelain in a limited edition to exacting standards of the Bradford Exchange.Dated 2000. Measures 9 1/4” in diameter. Excellent like new condition. There are no cracks or chips Ready to add to your collection, enjoy and use or give as a gift.Very beautiful with the 22K gold trim. 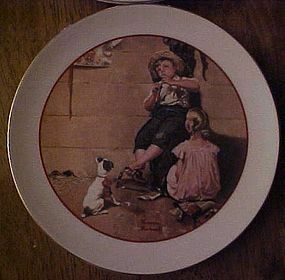 Complete set of 4 Norman Rockwell plates from the Young Love Collection. 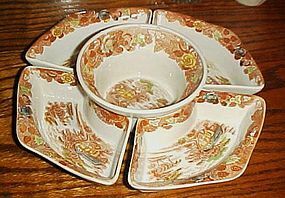 Plates measure 6 5/8" diameter and have gold edge trim. This is a special edition set from 1982. All are in perfect like new condition, but no box. Selling as a set of 4. 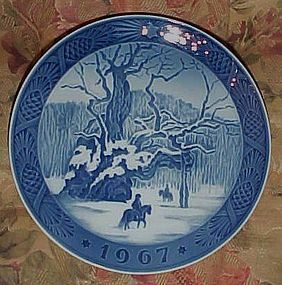 The Royal Copenhagen annual blue and white porcelain Christmas collector plate for 1967 is titled The Royal Oak, designed by Kai Lange. It's 7-1/4 inches diameter and in excellent condition with no damage or wear. The back has hanging holes. Plate only, No box. 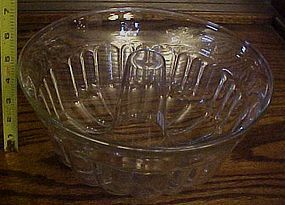 Nice LARGE tempered glass jello mold holds 14 cups comfortably and even 15 if you fill it to the brim. 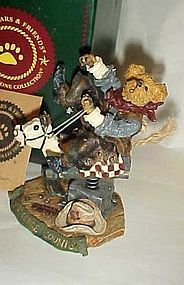 Measures 5" tall and is 10" in diameter. Excellent condition. No scratches or stains, or cloudiness. 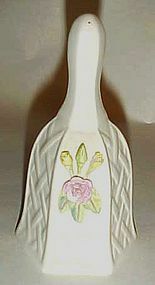 Belleek cottage rose bell from the End of Edition Collection. Sold by QVC. This delicate handmade piece is a classic Parian china dinner bell decorated with handpainted flowers in a lattice design on the front. 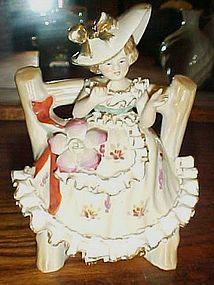 From Belleek Irish Porcelain. 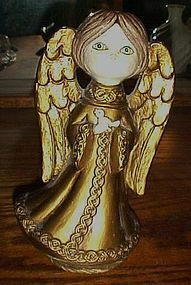 Measures approximately 5-1/4"H. Green mark Made in Ireland.Perfect condition. 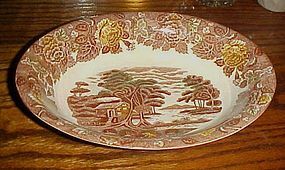 Nice 8" X 10 1/2" oval serving bowl in the Nasco Mountain Woodland pattern. This piece a little harder to find. Pretty brown transferware with random watercolor highlights of green and yellow. Perfect condition with no chips or cracks.I have 4 avaialble, 3 are perfect and 1 has a chip on the underside. (Chipped one is 1/2 price) I have LOTS of pieces I will be listing in this pattern. Nice 5 section lazy suzan in the Nasco Mountain Woodland pattern. This does NOT come with a turntable. I have one listed with one though. Pretty brown transferware with random watercolor highlights of green and yellow. Perfect condition with no chips or cracks. I have LOTS of pieces also I will be listing in this pattern. 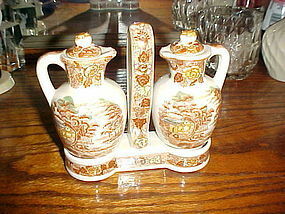 Nice matching creamer and covered sugar bowl set in the Nasco Mountain Woodland pattern. Pretty brown transferware with random watercolor highlights of green and yellow. Perfect condition with no chips or cracks. 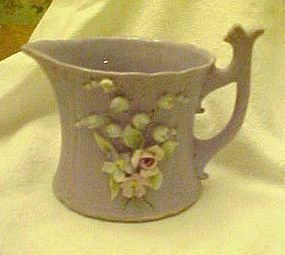 I have LOTS of pieces also I will be listing in this pattern. Nice Vinegar and oil cruet set with lids and original caddy in the Nasco Mountain Woodland pattern. Pretty brown transferware with random watercolor highlights of green and yellow. Perfect condition with no chips or cracks. I have LOTS of pieces also I will be listing in this pattern. 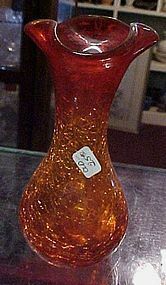 Pretty vintage amberina crackle glass vase with ruffles top. Measures 7' tall and is in perfect condition. Pontil on the bottom and some wear which shows age. Very nice! 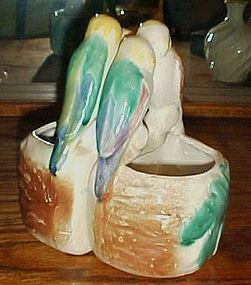 Vintage pair of MORTON POTTERY Parrot, parakeets or lovebirds Wall Pockets. Each pocket has a pair of birds on it. Very pretty, beautiful coloring. 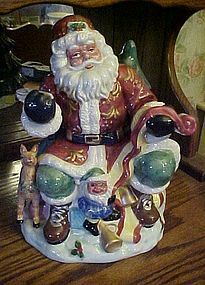 Size: 7"h x 4"w Condition: Wonderful vintage condition, no chips,cracks or crazing. Awesome heavy glass beer mug featuring our favorite sassy cat Garfield by Jim Davis. 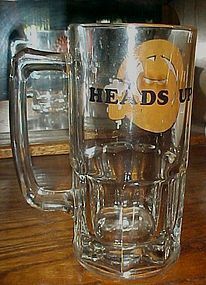 Back side says "Heads Up". Graphics are in Mint condition on this 32oz 1978 dated, Garfield Mug. Measures 8" tall and is PURRRfect.